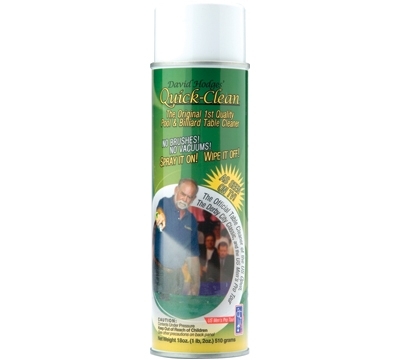 Use David Hodges' Quick-Clean Table Cleaner to keep your pool table cloth clean and ready for play. It's a gentle and effective dry foam cleaner. Just spray a light mist on your table's cloth and wipe with a cloth for a cleaner table. 18 oz. bottle. For best results, use with the Quick-Clean Micro Fiber Wiper. The spray creates a positive charge on your table and the microfiber has a negative charge, so they are attracted to each other. Sorry, this item cannot be shipped via air services.